David Schwimmer has got engaged to British girlfriend Zoe Buckman. The couple have been dating for the past three years. They met when the Friends star, 43, was in London directing the Simon Pegg movie Run Fatboy Run. At the time the 24-year-old, who is now a photographer, was working as a waitress at the The Cuckoo Club bar, a well-known celebrity haunt. 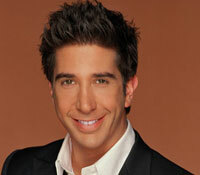 It was reported last week that the actor, best known for playing Ross Geller in Friends, had popped the question. His representative has since confirmed the news. The couple are currently living in Chicago while working on stage show Trust, which had its world premiere this weekend, according to a report in Sky News Online. A friend said: "David is smitten with Zoe and says she is ‘The One’. Things have moved very fast. He wanted to see how they got along living together and it has been a big success. "He has been living with Zoe in Chicago while working on a stage show called 'Trust' and they will probably make an announcement when they come back to Los Angeles. We are all bracing ourselves for good news. He has said we won't have to wait long," Ireland Online reports. The Press Association news agency says, David - loved by many for playing Dr Ross Gellar in hit US sitcom Friends for 10 years - reportedly met Zoe while he was in London directing the 2007 film Run Fatboy Run, starring Simon Pegg. David's previous girlfriends have included singer Natalie Imbruglia, his Kissing A Fool co-star Mili Avital, and French actress Emmanuelle Perret - but neither he nor Zoe have been married before. Meanwhile, fellow another former Friends star has poured cold water on fans' hopes for a reunion. Jennifer Aniston told Capital Radio of the rumoured movie spin-off: "There's no film. There are such legs on that rumour, but no!"